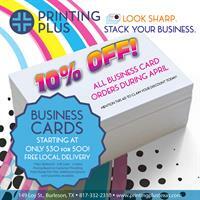 10% Off all Business Cards in April! Get 500 cards for only $27 with 10% off business cards for the month of April! Additional quantities and options are available. Contact us today!